Embedded motion engineers have to know how the smart electronics get placed within the physical structure (“embedded”) and how each component moves relative to each other (“motion”). In this article, I’d like to discuss how we describe and model the latter term, motion, which we often take for granted as being quite simple. How can we make the motion smoother and more elegant? What’s the best way to achieve the desired motion? To answer these questions with high technical predictability, we often enlist trusted kinematic and dynamic models. Sometimes the models we find in the Machinery’s Handbook, the Engineering ToolBox, Wikipedia, or elsewhere on the engineering web will be sufficient models for our scenario. Sometimes, they don’t hold water, and we need a model with stronger predictive capabilities. An oft-quoted engineering saying goes, “All models are wrong. Some are useful.” No doubt, the tenet also applies to 3D motion. Some kinematic and dynamic models can be appropriate in one scenario, but insufficient in other scenarios. For motion, the universally applicable equations can handle multidirectional 3D rotating and translating bodies, while the simple equations can only handle translation and unidirectional rotation. The simple equations can be appealing because they’re quick and easy. I’ll illustrate this idea below by comparing two systems that require different approaches for appropriate kinematic models. The diagram below shows a simple gear system. The bottom rack is driving the two gears and another rack. Let’s assume the centers of the two gears are fixed, so that the gears are only rotating, and the top rack is moving in the x-direction. If the bottom rack is moving at ν1 = 1mm/s, how fast is the top rack moving (assuming no loss in the gears)? 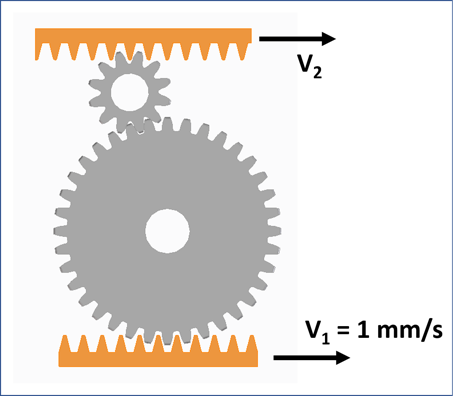 The angular velocity (ω) of each gear is equal to the time rate of change of just one angle (θ). For the larger gear, for example, we can say that its angular velocity is described by ω1 = θ̇1. By essentially treating this system as 2D, we’re safe to use ν = τω in our analysis. Applying the relationship to design our system yields that ν2 = ν1. What do we do when we encounter 3D motion systems that have parts rotating in more than one direction and not about their center of mass? How do we define the angles? What is the angular velocity? The motion of a quadcopter is a suitable example of a more complicated 3D motion system. For a quadcopter, we want stable control over its position (“Where is it located? How fast is it going?”) and orientation in space (“What’s the ‘tilt’ angle?”). 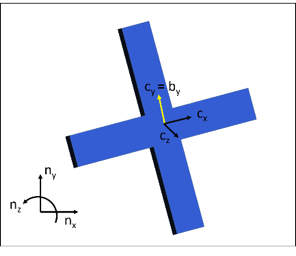 It’s possible for a quadcopter in flight to translate in x, y, and z directions and rotate about x, y, and z (where x-y-z are three orthogonal directions fixed in the space). To keep the quadcopter stable, we’ll use a gyroscope to measure the angular velocity about each axis, and feed that information back into the control algorithm. 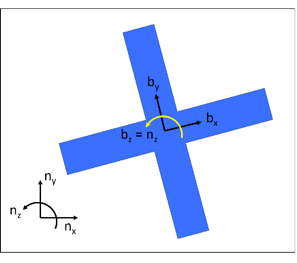 A 3-axis gyroscope will spit out three values for angular velocity, but note that these angular velocities correspond to axes that are fixed on the quadcopter. These x-y-z axes are not the same as the x-y-z axes that relate back to the quadcopter’s position, velocity, and acceleration in space. The conversion, so to speak, of the gyroscope’s output into something digestible by the control algorithm is where the 3D dynamics model comes in handy. A reference frame is what I’m calling a set of three orthogonal unit vectors attached to a certain point. For this example, the only object is the quadcopter, so we’ll treat that as a single rigid body. (We’ll ignore the other parts on the quadcopter here.) We’ll say that a reference frame N is fixed at a point on the earth and is made up of n̂x, n̂y, and n̂z. We’ll attach a reference frame D to the center of mass of the quadcopter. Reference frame D is made up of d̂x, d̂y, and d̂z. The diagram above shows a simplified depiction in CAD. At the end of this work, we’ll use rotation matrices to express each of the angular velocities in terms of Euler angles. Euler angles provide us one way of precisely describing the orientation of a body in 3D space. (Note that Euler angles don’t necessarily correspond to what we call yaw, pitch, and roll.) We will finish with precise expressions for ω1, ω2, and ω3. Since the quadcopter can rotate about more than one axis, we no longer have a simple ω1 = θ̇ relationship, and we can’t use ν = τω to generally describe the velocity of a point on a quadcopter. In fact, an equation for ω1 looks like ω1 = φ̇ = cos α + α̇ - θ̇ sin φ where θ, φ, and α are the Euler angles. The equations for ω2 and ω3 are no less messy, unfortunately. In short, it’s easy to see how the definition of the 3D system extends beyond what we find in traditional dynamics resources. For more details on these calculations, see the extra credit section. When we model complicated 3D motion phenomena, it’s key to distinguish between scalar and vector quantities. Remember, a vector has both a magnitude and direction (e.g., 25 mph in the northeast direction), while a scalar is something that just has a magnitude (25 mph). When we bring into our model other physical values (velocities, accelerations, linear and angular momentum, forces, torques, and so forth), we should first think of them as vector quantities. For instance, when we talk about torque, it’s useful to specify both its direction (e.g., about the positive z-axis), as well as its magnitude (5 N-m). The benefit of using a more complex model is that you can precisely define all the quantities related to angles (the orientation, angular momentum, moments, and products of inertia, and so forth) for any motion system made up of rigid bodies. The equations can get gnarly, so it’s often wise to use software programs like MATLAB, Working Model, or MotionGenesis. Note that if I were following the 3D model methodology in my gear example, then I would explicitly treat the velocity and angular velocity as vector quantities. But again, the motion in the gear example fits my criteria for simplifying down to 2D kinematic equations, and I avoid the time-heavy definitions of a 3D model. If I have a more complex motion system, then I must treat the kinematic and dynamic quantities as vectors, or I risk having a poorly predictive model. We’ll use intermediate reference frames to describe the orientation of the quadcopter. We’ll call the initial reference frame attached to the quadcopter B. Initially, b̂x= n̂x, b̂y= n̂y, and b̂z= n̂z. Reference frame D is still attached to the body, and initially, d̂z = b̂z= n̂z. We will rotate first about b̂z (which here is equal to d̂z), and we will rotate by angle +θ. We can then write that B’s angular velocity in N is . We will then rotate about another fixed axis on the body, d̂y, and we’ll call this new intermediate reference frame C. Initially, ĉx = b̂x, d̂y = ĉy = b̂y, and ĉz = b̂z. We’ll rotate by angle +φ about ĉy. We can then write that C’s angular velocity in B is . 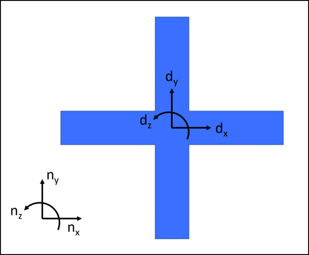 Last, we will rotate about the fixed axis d̂x. Initially, d̂x = ĉx, d̂y = ĉy, and d̂z = ĉz.We’ll rotate by angle +α about d̂x. We can then write that D’s angular velocity in C is . Josh Siegel is a mechanical engineer at Simplexity Product Development, an engineering services firm that specializes in the development of embedded motion products. He holds a BS in Biomechanical Engineering and an MS in Mechanical Engineering from Stanford University. He specializes in mechatronic and mechanical system design, and he is passionate about how we can best leverage technical tools to inform design decisions across the entire product development process. He writes about mechatronics, product development and technology on the Simplexity Product Development blog.